Home » Featured » Feed me Feed me now! This too shall pass. I’ve long sworn it is my parenting mantra. And yet time and again I find it hard to accept. We had the most worrying time with my daughter in late December and early January. Actually it was building for months before that. 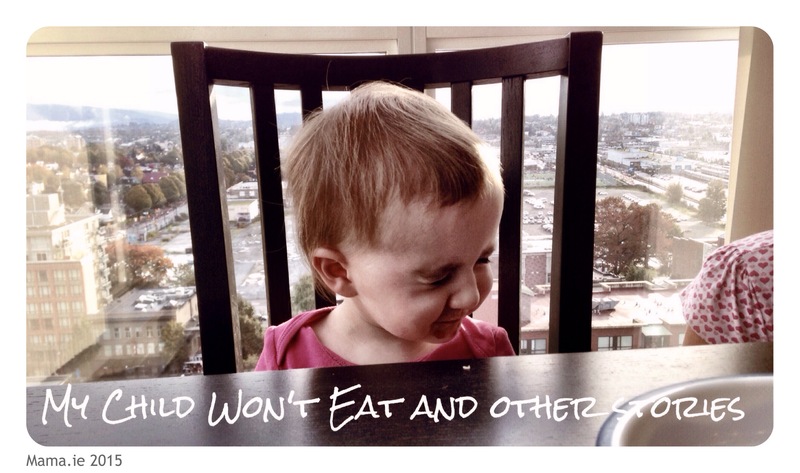 Back in late August, she cut her first tooth at the ripe old age of 17 months and lost her appetite for a week or two while it was happening. Then we went to Vancouver in October to visit my brother and his family, and never a great traveller, she was off her food while we were there. I think she ate one good meal in two weeks. It was a similar story on our return. It took her well over a week to readjust to the time difference. Finally she perked up in mid-November. And then disaster – she got a mild tummy bug and spent a couple of days vomiting. Oddly enough she was still eating then. Just before Christmas she got very sick – you know one of those viruses that leaves them with a high temperature, no energy and no appetite. The fever passed but her appetite didn’t return. Small wonder because she cut several more teeth that month. But when you’re small to begin with, a few illnesses in a row like that can really knock you. Which is what seemed to have happened. We were at a bit of a loss. When our son went through similar periods as a toddler, we just gave him extra bottles. But cows’ milk plays havoc with my daughter’s digestion and can leave her screaming with constipation if she has more than a few ounces in a day. Thank goodness I was still breastfeeding. As my father gravely pronounced one day “It’s the only thing that’s keeping her alive.” Not quite the reassurance I was hoping for but he had a point. On the advice of a friend, I bought My Child Won’t Eat and read it from cover to cover. She was right to recommend it. This book should be on the must-read list of every new parent. We took some deep breaths and went back to trusting ourselves and our child. I kept breastfeeding her in the evening, and she had a bottle of cows’ milk too. We added some Complan to her bottle to add some extra calories. And then we followed her lead with food. When she wanted to eat only butter and no potatoes I reminded myself that Americans pay a fortune for our butter made from the milk of grass-fed cattle, and I got her a spoon. I didn’t realise it yet but that was the turning point. She sought high calorie, high fat foods for a week or two. Would eat nothing else. And then gradually started to show an interest in regular foods again. In early February, we had her 18-24 month checkup with the public health nurse and when she was weighed, she had gained half a kilo. Out of nowhere, her eating ramped up a notch – or ten – a week or two ago, and now this child who we couldn’t feed – well, we can’t keep her fed! The irony isn’t lost on me. If you think I’m exaggerating, let me run you through her breakfast the other day. A bowl of Weetabix. A bowl of Cheerios. A bowl of Ready Brek. A sausage. A yogurt. I honestly don’t know where she is putting it. 20 minutes later and we hear what is fast becoming a familiar refrain “Eat! Me Hungry! Eat!” A mandarin and some apple later and she was satisfied. For a while at least. I laughed when I put on her pyjama suit tonight. A fresh suit that she hasn’t worn in two weeks. When she last wore it, it fit perfectly. Tonight it seems to be an inch too short. Out of curiosity I weighed her. A smidge under 10kg. 15 years (NOW I feel old!!) at this parenting lark, I still have that ‘what if voice’ louder than the rest! Abbie still isn’t a great eater, she’s not a great sleeper either mind, but I have found the nights she does sleep, she eats better the following day, perhaps that’s just a coincidence. One look at herself and Harry and you would be likely to suggest that he is eating her food too lol! It’s true Nicola. They are all so different. I think sometimes that’s the hardest thing to remember. You promise yourself you won’t compare them to other kids their age, but it’s inevitable that some comparisons go on, and it’s hard not to worry when you’re afraid something is wrong. Excellent piece, I think we all go through the “what if’s” and doubt ourselves especially around our little ones health and feeding! You are so right we need to trust our gut instincts more and listen to our little ones too! It is Not Maud of Awfully Chipper who should be getting the thanks. I’m pretty sure she was the one who recommended the book to me originally. Great post, I’ve been there too. It is hard not to obsess, maybe our reptilian brains going back to a time when it really was a case of having to eat when food was available. Been there Lisa, and still at it to be honest. But yes, I was also recommended “My child won’t eat” and started to realise that just because she didn’t eat when I wanted her to eat, or what I wanted her to eat, didn’t mean she wasn’t eating. She actually ate loads, a spoonful of this and a piece of that and trying this and trying that…which added up to a lot. And similar, she craves carbs at one stage and only ate the. But now she’s eating us out of house and home and a top that was too big just before Christmas now fits her perfectly. I always wonder what has become of us humans that we really don’t trust ourselves any more. I’m really glad your little one is over her illness and eating like crazy. Thanks Muuka. I think it’s our need to count and measure that trips us up. We forget that our kids are only concerned with eating to satiety and not to a specific measurement. A lot of the time they know better than we do I think. Thank you. You’re right. The fact we are bombarded with information doesn’t really help sometimes. What a really great post. I think trust isthe most important part in parenting: trusting them and ourselves. 17 years at this parenting lark… ancient!!!! I used to get so uptight when my daughter refused food but like your lady she’s a mighty grubber now!